Back in September last year Michael suggested everyone check out BlogMusik quickly before it was shut down. BlogMusik is a service born in France that lets you search for mp3 files on the web and listen to them in streaming mode for free. At the time the service was young and had no particular licensing agreements. A few months later, the SACEM, the organization in charge of collecting payments for artists’ rights sent them a cease and desist letter with a view to stop the service. A lot has happened since (beyond a rather nice site redesign and addition of sharing features). BlogMusik will announce tomorrow that they came to an agreement with the SACEM, clearing the service of copyright infrigement accusations. The details of this agreement are not are not being disclosed, but other deals suggest it is based on a revenue sharing mode. BlogMusik’s business model is relying on advertising and affiliate revenue coming from the sales of songs on iTunes and Amazon. This agreement should cover BlogMusik for any music they host wherever the music is listened from. However they still have to come to an agreement with organizations representing majors and labels (Pandora had to face new webradio rates imposed by the RIAA). This is being taken care of according to the CEO of the company and new agreements should be announced soon. 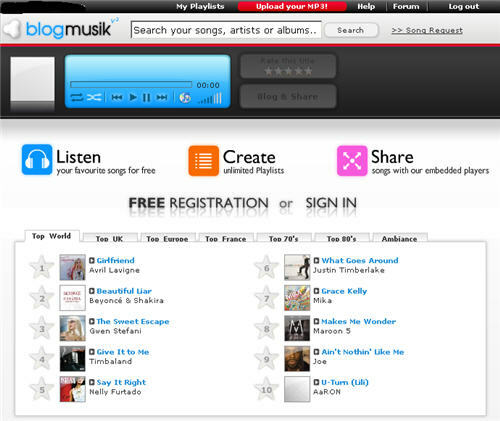 All in all this is a good news for BlogMusik The company now has an opportunity to become a true free legal alternative to listen to music on the internet. Unlike Pandora this is a music on demand service where you choose the titles you want to listen to (although you have a smart playlist option to generate automatically radios out of a song or an artist). BlogMusik.net will also change name and become Deezer.com. This is a good thing i had a hard time getting the UR/nameL right with this “k” in the middle (not mentionning the .net). RadioBlogClub, another popular french service was forced a few months ago to change hosting provider following a complaint sent by the same SACEM. The service was interupted a few days and opened again as fresh as new. To date no official licensing agreement was made with the company.